The name "Corno di Toro" is actually Italian for "Horns of the Bull". Though their red color suggests chile pepper heat, these peppers are actually some of the sweetest peppers around. 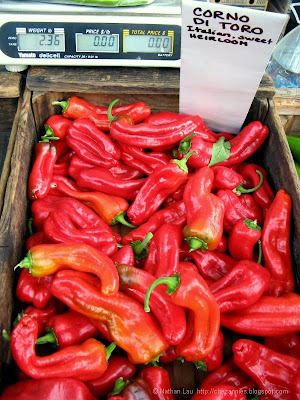 In fact, the yellow variety of these peppers was voted among the best sweet peppers by Sunset Magazine. We picked up some of these Corno di Toro heirloom sweet peppers from a vendor at the Los Altos Farmer's Market and used them in place of regular bell peppers for the Mexican Chopped Salad recipe that we've previously done twice. 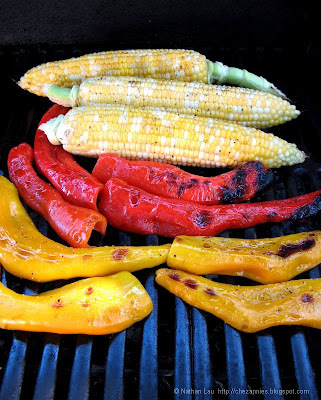 We took two red and two yellow Corno di Toro peppers, halved and seeded them, then grilled them along with some becautiful bicolored corn on our gas grill until the pepper skins were blackened. After grilling them, we cut the kernels off the corn and then diced the grilled peppers. We also diced a couple of heirloom tomatoes, peeled and diced a medium-sized jicama, and pitted and diced a couple of fresh avocado fruit (all procured at the farmer's market). We arranged all the ingredients in separate sections on a large platter along with a can of black beans (drained). Then we garnished with chopped cilantro (again, from the farmer's market). The dressing for this salad is made from extra virgin olive oil, garlic, shallots, lime juice, orange juice, honey, ground cumin, and salt and pepper. Each person scooped a little portion of each salad component to their own plate, spooned on some dressing and then mixed them together. I really like this salad because there are a lot of flavors and textures going on in each mouthful. 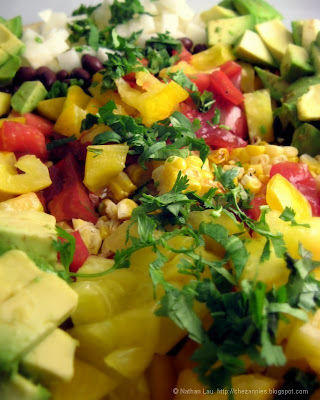 You have the sweetness of the corn and the peppers, the umami of the tomatoes, the crunchiness of the jicama and the creaminess of the avocado. The cumin in the dressing gives it interest while the citrus juices tie everything together. All in all, a wonderful salad! This recipe was entered in the No Croutons Required - Fruit Edition roundup hosted by Holler at Tinned Tomatoes. If you liked this post, won't you consider subscribing and getting all our latest posts by email or by RSS? Beautiful peppers -- I've never heard of that variety. Sometimes I feel that here in the Northeast we are so limited in the pepper arena! Lovely salad! It looks and feels so summery! I've never seen that variety of pepper here before, but that's for the tip. I'll be looking out for it. Lydia, even out here, a wide selection of peppers is not that easy to find. Those look exceptional in both quality and freshness. That salad looks great. Oh, Annie, I am finally getting some ripe Earl's Faux, Marianna's Peace and Doc Wyches. Seems to have taken forever. @Lydia - I'm sure someone has figured out how to grow sweet peppers successfully! @JS - Hope you can find these - they're so good with salad. @Robert - Yes, our tomatoes are finally starting to produce in mass quantities! Yum! That dressing sounds divine - light and citrus-y - perfect for the extra dose of summer we're having here in the Northwest! That looks lovely, thank you for submitting it to No Croutons Required :) Good Luck! @Wiffy - what can you get at Carrefour? @KayKat - hey, send some of that summer back down here! Your salad looks gorgeous Nathan! 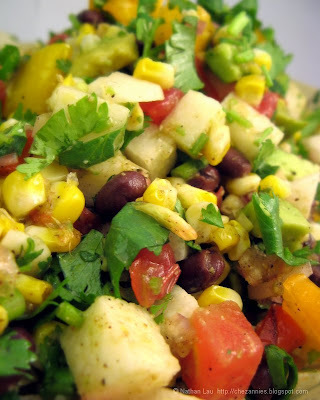 I love the combination of the chargrilled pepper and corn and that fruity dressing. Lovely! I'm growing these peppers! I'm going to try this recipe using them. Thanks.